Written in a clear, non-technical style, NEW TESTAMENTSURVEY is an analytic and historic survey which sets forth the message of the New Testament against a fully integrated picture of the world of the first century. 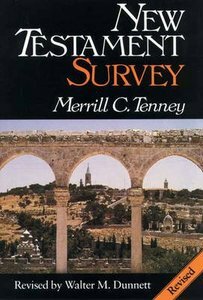 Customer Reviews For "New Testament Survey"
My copy is from 1985- but Tenney first published in the early 50's. A dear friend of mine convinced me to begin a course of study- which depended heavily on this book. So, initially, the reason for reading was not optional. The course I was studying wasn't interesting, but the book was. I kept the book and ditched the course. Bristling with interesting charts and lists of who did what when, you can tell without knowing his educational pedigree, that Tenney was a master at keeping students interested. The word "Survey" has come to differ in meaning since the 50's-( 60 yrs ago), but seeing the NT  world through the eyes and study of Tenney will be a blessing.